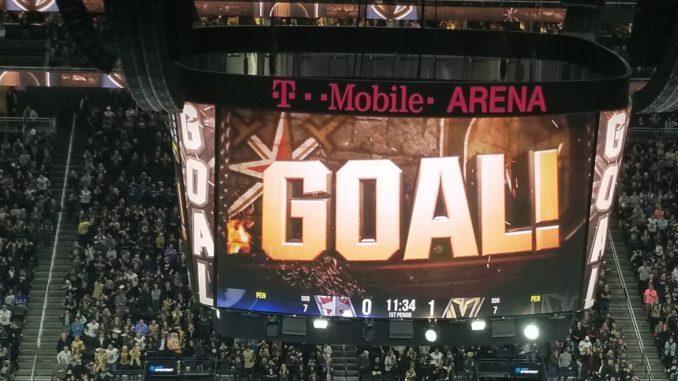 The NHL Vegas Golden Knights have scored in winning hearts on and off the ice. 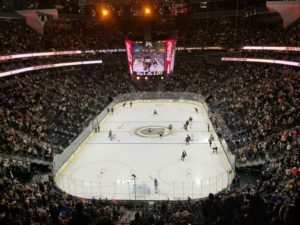 Vegas Golden Knights games fill the T-Mobile Arena. March Madness is reigning in Las Vegas, but here I am taking a break from college hoops viewing to trek to the T-Mobile Arena for a Vegas Golden Knights hockey game. Locals have gone bonkers over this, their first pro sports team, and I want to see if the arena action lives up to the hype. It’s a sunny-but-cool spring evening. A giddy and Rubenesque bachelorette party is riding with me on the Mandalay Bay-to-Excalibur tram. They’re still taking selfies when the tram door opens. 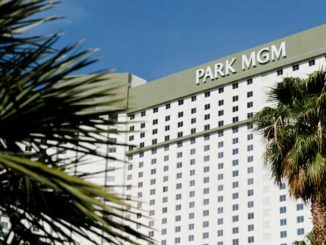 I exit, walk across a street bridge and start making my way down the Strip in front of the New York-New York casino-resort. The new T-Mobile Arena is just behind it. Recall that in its inaugural 2017-18 season, the Knights went all the way to the Stanley Cup Final, losing to the Washington Capitals. It was the prior March, right at the start of last year’s postseason, that I discovered NHL hockey in the desert. To the chagrin of my Baltimore-Washington-based friends, I jumped on the Vegas bandwagon. There’s a three-member band playing on a stage in front of New York-New York. The lead singer is wearing an oversized, steel gray-and-gold Knights jersey. In fact, as I get closer to making a left turn at the front corner of the casino it becomes apparent that people not wearing hockey jerseys are in the minority. It’s impossible to forget that the Knights’ first season kicked off under the cloud of the infamous and tragic Vegas shooting attack, when 58 people at a country music festival lost their lives. By all accounts, the team did everything right in honoring the gravity of the situation during home-opener ceremonies. The Knights dedicated the season to the city in a heartfelt way that was respectful and helpful to those who were grieving. So, I turn the corner at the end of New York-New York and unexpectedly merge into the tail end of a pre-game parade. Trying to pass but not get in the way, I scurry along beside pom-pom-waving cheerleaders, knights wearing medieval armor and a marching drum corps. Leading the parade are the sparkly Vegas Belles, showgirls in two-piece costumes and plumed headdresses designed in team colors. 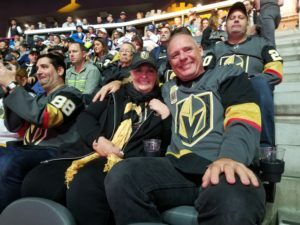 Golden Knights jerseys are popular with fans. The Knights are playing the Winnipeg Jets tonight. There are plenty of fans inside the T-Mobile Arena draped in blue-and silver Jets jerseys that bear their favorite player’s name on the back. Visiting team colors are out-numbered by Vegas jerseys, though, many of which bear the number 17, and instead of a player name read: VEGAS STRONG and VEGAS BORN. With a media pass hung around my neck, I sit on press row to watch the multimedia pregame entertainment. One video shows exciting season highlights simultaneously on the Jumbotron and on the ice below. Another live show piece depicts an ice-skating knight pulling a sword out of a stone at center ice. I’m pumped. “There’s definitely something like a college sports-town vibe at these games,” says Alan Snel of LVsportsbiz.com, who’s sitting next to me on press row. “There are locals who get in a real funk if the team is on any kind of losing streak.” Nearly every game sells out. There are 18,430 in attendance tonight. Less than 30 seconds into the game, the Knights and the Jets get into a spirited but brief fistfight. A minute later, center William Karlsson finds the back of the net for the Knights. Pandemonium ensues. Lights of all kind wildly bounce and flash. Horns blare. The crowd is on its feet to cheer, then collectively morph into a “Go Knights, Go!” chant. More than a hashtag: #VEGASSTRONG. The Knights shutout the Jets and win, 5-0. 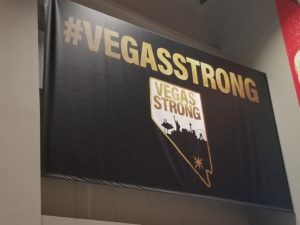 As I make my way out of the arena a giant #VEGASSTRONG banner catches my eye. It gives me pause. Yes, everybody’s got a hashtag these days. But #MYTEAMISGREAT, or some variation of that theme, certainly doesn’t have the same gravitas. Click on this link to subscribe to the Junkets & Jaunts monthly newsletter!